PHILADELPHIA, PA – April 5, 2016– Janney Montgomery Scott LLC (“Janney”), a leading full-service wealth management, financial services and investment banking firm headquartered in Philadelphia, PA, today announced that Jane S. Goodyear has joined S.C. Asset Advisors in Janney’s Columbia, S.C. office as a Financial Advisor. She will be joining the team of Simms Oliphant, Chris Smith and Julie Boulware. Goodyear, who first started in the financial services industry in 1997, comes to Janney from Merrill Lynch where she was a Registered Senior Client Associate. She graduated from St. Mary’s College in Raleigh, N.C. as well as the University of North Carolina at Chapel Hill. 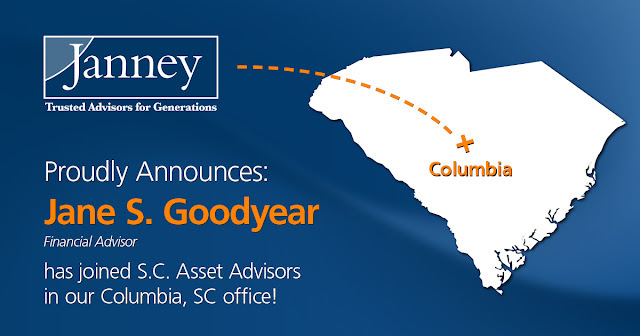 Janney’s Columbia, SC branch office is located at 1441 Main Street, Suite 700, Columbia, SC 29201.